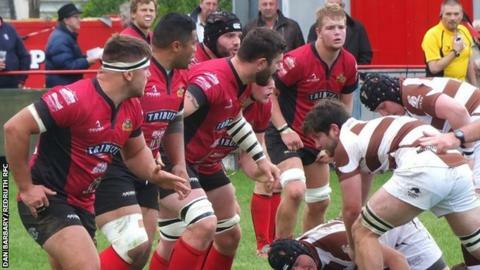 Redruth head coach Steve Larkins says his side "deserve a medal" for the way they played in their 34-32 win over Chinnor in National Two South. The Reds scored five tries to register their fourth win of the season and go fifth in the table. Larkins' side conceded a try with 10 minutes to go but held on to win. "It was bodies on the line when we were defending our five-metre line. To get away and sneak that win was impressive," Larkins told BBC Cornwall. "It was just fantastic. They deserve medals for what they did. "Chinnor are not a team that's going to be near the bottom, they'll go on a roll and win four or five on the bounce and they'll get out of trouble, that's for sure, because they've got too much quality. "But our boys were just 10 out of 10."